The reason we chose PH as our Official Hydration Partner is that everyone loses a different amount of sodium in their sweat and their multi-strength drinks have up to 3x more sodium than traditional sports drinks. Why is sodium so important to your performance? We've got you covered during the race, with PH available at the Outposts on the course at every Maverick event. But ensuring you start hydrated can significantly improve your performance. How to START hydrated and why that's so important. This is definitely something to consider if you suffer from cramp when you've been sweating for a while. Why do athletes suffer from cramp? PH's drinks are all hypotonic, which makes them absorb faster than traditional isotonic sports drinks. This blog explains the different types of sports drink and when to use them. The Precision Hydration drinks at our Outposts contain 0-17g of carbohydrate per serving, so you’ll need to get the majority of your energy from other sources. PH generally advocate fuelling your efforts through solid and semi-solid foods. Read this blog for more on how PH fits into your wider nutrition strategy. TRIBE, our official nutrition partner, are here to help you go further, train harder and push your boundaries to continuously improve. We’re not just in it for the end result, we’re in it for the journey. A bowl of oats and milk will give you about 45g carbohydrate // 15g protein // 15g fats. It's a pretty complete meal in terms of macros, low in sugar, and a great source of slow-release carbs. 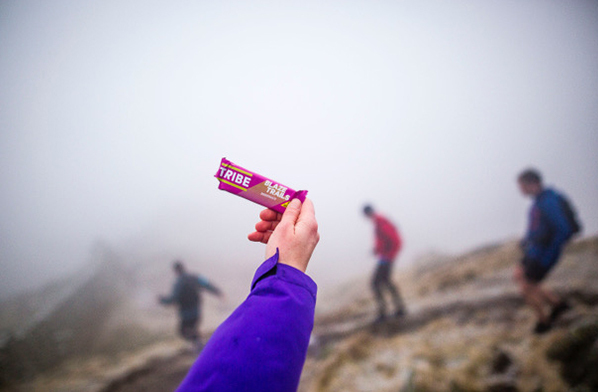 You could top your porridge with a packet of TRIBE Trail Mix. If you eat breakfast more than 3 hours before the race start, have a TRIBE Blaze Trails bar 45 minutes before, for a quick-release pre-race energy boost. If you are running the short distance and do not want a large breakfast before, go for a TRIBE Infinity Bar. They give you a great complex of nutrients. They're built from five endurance grains (including teff, the Ethiopian supergrain), include natural ingredients only, and deliver 40g complex carbohydrate per bar. Your chance for a treat! Refuelling post-race is key. The key nutrients here are protein and carbohydrate. Take something on within an hour of finishing. Take on between 10 – 20g of protein & 20 – 40 g of carbohydrates within half an hour post-race. We recommend going for a TRIBE Shake that gives you 20g of protein for recovery. Always go for natural ingredients (these are richer in micro-nutrients and easier for our bodies to absorb). Giving your body these nutrients will help you recover, so you can go again tomorrow!